OUR NOD TO PROVENCE, BASQUE COUNTRY, AND CLASSIC FRENCH BISTRO. Nestled in the charming Beverly Glen Centre, along historic Mulholland Highway, sits Bistro Jolie. Serving southern French-inspired cuisine accented with California flair and seasonal sensibility, Jolie blends the best of both southern cultures in ambiance, service, cuisine, and style. 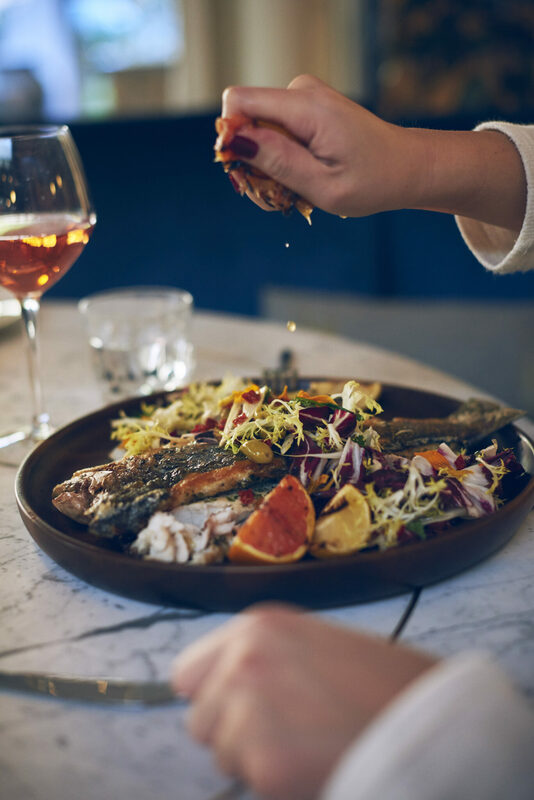 Whether you are seeking classic bistro fare such as Steak Frites or something a little more singular like our Fig Leaf Roasted Salmon – Jolie has a unique balance of the familiar and the soon-to-be-discovered. Immerse yourself in the lush blues of our Riviera-inspired dining room – accented with marble, brass and warm inlaid wood. Relax outside on our heated and covered patio, sit at the chef’s counter and enjoy the show with our open kitchen, as our kitchen team is hard at work cooking your next favorite dish. Or perhaps you would like to grab a seat at our full-service bar, underneath a beautiful, foliage framed skylight – we look forward to having you as our guest and hope to see you back often. Perfect setting for just about every occasion. The quality and taste from aperitif to dessert was impeccable. The Steak Frites is an absolute MUST! To top it off, the service was so accommodating and attentive. Love Jolie and highly recommend it to all. Great new spot! I came here with my wife and two young daughters and all left happy and full. Highly recommend the bread plate, Niçoise salad, steak frittes and king salmon. We are looking forward to trying the rest of the menu and soon to start lunch and hopefully brunch service as well. Ask the bartender for an "Old Cuban". Top notch cocktail. Best I've had since L'Avenue in Paris. Bistro Jolie is my new favorite restaurant. Excellent service and food! My friends and I had dinner there last night. We had the crab salad, which was new to the menu (please keep it on the menu)! Super flavorful and generous portions of fresh crab. The pasta gigli was also amazing! We loved the chick pea and brussel sprouts appetizer as well. They have ridiculously delicious desserts! The Basque cake is a must and mango sorbet was so good. I can't stop thinking about all the delicious food and friendly staff. Monday-Friday: 7:30 a.m. – 10:00 p.m.